With Mailing list integration you can connect Back in Stock to your store mailing list provider. Once connected, your customers can opt-in to your mailing list at the same time as creating a product notification. It’s simple to setup, and you can select which mailing list new customers are added to. This feature is available on all Back in Stock accounts on a paid plan. Note: This integration is entirely optional. Back in Stock works fine without connecting your mailing list, and after connecting customer email notifications are still sent by Back in Stock. When using a mailing list provider you will need to have your account setup before connecting. To get stated choose Customize from the app menu, then MailChimp integration. Click Connect to MailChimp and follow the instructions. You’ll be redirected to the MailChimp site to enter your account credentials to authorise access. To get stated choose Customize from the app menu, then Campaign Monitor integration. Click Connect to Campaign Monitor and follow the instructions. You’ll be redirected to the Campaign Monitor site, asked to login if necessary, and then to authorise access. From your Back in Stock dashboard choose Customize, then Constant Contact integration. Click Connect to Constant Contact and follow the instructions. You’ll be redirected to the Constant Contact site, asked to login if necessary, and then to allow access. The Shopify Customers integration adds the customer's email address to your Shopify Customers list when the opt-in to your mailing list. Many external tools integrate with the Shopify Customers list so this integration can act as a bridge to connect data to other tools. Learn how to setup the Shopify customers integration. Click Account (at the top right of the page), then choose Account from the dropdown. Give you API Key a name, such as Back in Stock, so you can identify it easily (this step is optional, but recommended). Copy the API key (it's a long sequence of letters and numbers) to your clipboard. Now, head to Back in Stock to add your API key. Choose Customize from the Back in Stock menu, then Klaivyo. 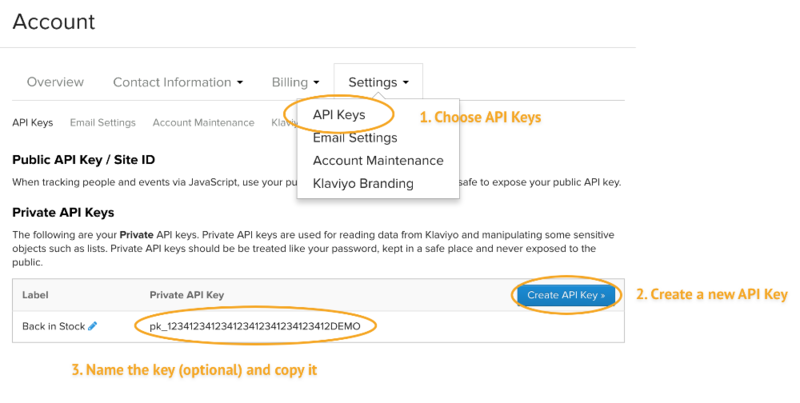 Paste our API key in the field labelled API key. Check the Enabled option, and confirm the correct destination mailing list is selected. This is the list new subscribers will be added to. Note that only your Lists will appear here, not your Segments. Once authorised you will be redirected back to settings page mailing list provider integration. To complete setup, ensure Enabled is checked and hit Save Settings. The product widget will be updated and a checkbox will appear in the customer notification form. If you run more than one mailing list from your MailChimp account you can select which list customers are added to by setting Destination list. If you prefer to have the opt-in checkbox pre-checked make sure Default to accept is enabled. The text used for the opt-in checkbox label can be customized in the Form label field. 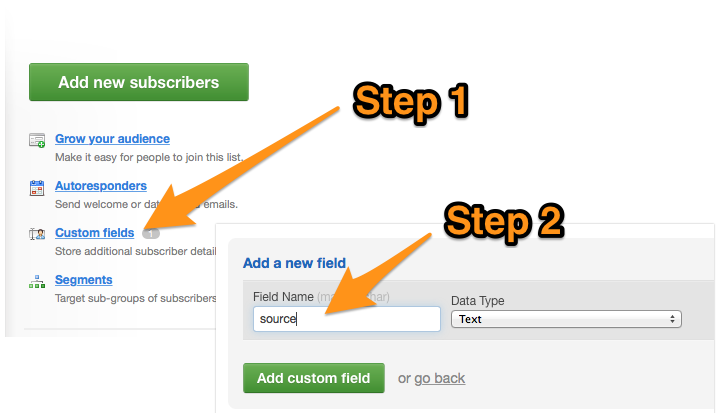 Any customers that confirm their MailChimp subscription will have the Source field set to Back in Stockautomatically. Campaign Monitor subscribers can have a source field set, but it must be created as a custom field first. In your Campaign Monitor account, open the list Back in Stock will be adding subscribers to. Create a custom field with source as the field name (leave the field type as text). Once the custom field has been created subscribers added by Back In Stock will have the source field set toBack in Stock. Customers added via Back in Stock to your Klaviyo list will automatically have the $source property set to 'Back in Stock'. Customer notifications aren't being added to the MailChimp list. Check you're using a real email address to test with which is not a current or past subscriber. If you have multiple fields set to 'required' iny our list the subscriber will be rejected. Make sure your list only has email as a required field. If a customer has previously been unsubscribed MailChimp will send them a signup confirmation email (this is double opt-in). The customer is only re-subscribed if they confirm by clicking the link in the confirmation email. I’m using a theme integration for Retina, Mobilia, Responsive, Turbo, or Parallax. I’ve enabled MailChimp integration but the checkbox doesn’t appear. After you have enabled your MailChimp integration simply install the theme integration again. The theme snippet will be updated to include the mailing list checkbox.